Darn it! I was at least half an hour late for church tonight. I was aware all day that I had Mass at 6:30 PM, but then at 4:30 PM or so I got involved in researching something for the other kind of journal entry, the kind that has to do with the general ledger rather than blogging. By the time I remembered about church again, it was 6:38 PM. D'oh! The church is quite close to where I work, but I had to pick Kevin up before I could go in. That's where the other twenty minutes went. I expect you're wondering why I had church at all on a Friday night in September, and why I'm posting a line drawing of an angel. Two questions, one answer. Tonight was Michaelmas, the Feast of St. Michael and All Angels. The drawing is St. Michael the Archangel. The church: The Episcopal Parish of St. Michael and All Angels. Tonight was therefore our "patronal feast." It shouldn't have been this hard to remember. I posted a notice for it online, but when the time came for me to actually go, I was distracted. Typical! But the only person who was really inconvenienced was Proscovia, who is in charge of the acolytes. She wanted me to be crucifer tonight, it turns out. I probably would have said no, simply because I'm not good at leaving work at a particular time. Even worse, I'm not good at remembering events that break my routine. Clearly. In case you're wondering, I'm not going to discuss the pros and cons of believing in angels. Not tonight, anyway. I will say, however, that I'm not at all fond of the cutesy female angels of popular iconography. I much prefer the concept of an angel like Michael: specific, canonical, male, and potentially dangerous rather than generic, trivial and harmless. As for forgetting church, I hope I do better on Sunday, when St. Michael's celebrates the Feast of St. Francis with the Blessing of the Animals. Tuffy has been making her annual trip to St. Michael's since before Noodle died. 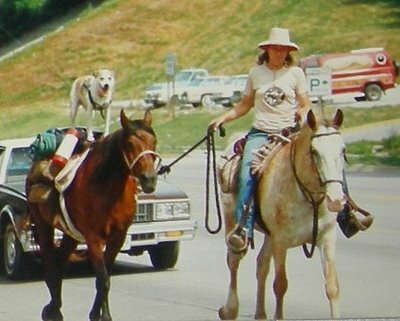 One year I got there, saw the animals, dropped off Kevin, and dashed home for Tuffy. It's interesting how doggie instinct works. If you visit Tuffy at my house, she will bark and run away. Eventually she will approach a few people she knows, but it takes a long time, maybe an hour. But that's not what happens when John and I aren't there to make Tuffy feel relatively safe. When we go out of town and Kevin takes care of Tuffy for us, she doesn't make it easy for him. She barks her head off, and never stops. 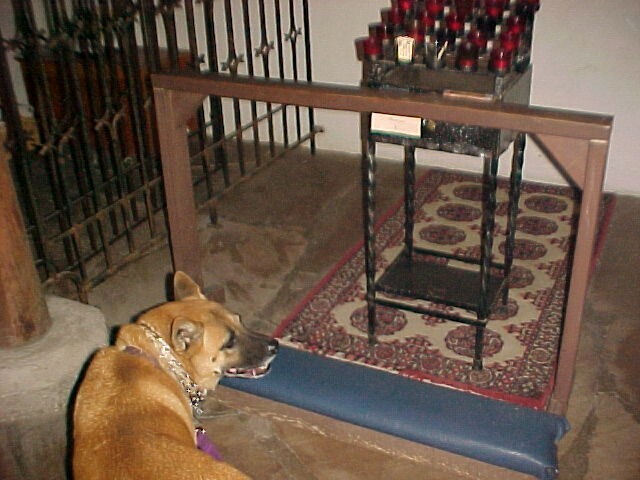 But at St. Michael's Tuffy is quiet and well-behaved. Away from her home territory, surrounded by strange people, dogs, cats, birds, turtles, hamsters, etc., she's a little restless and definitely shy, but most of the time she will lie down and hang out. She even comes up behind people and gives them a sniff, but she will back off if the person turns around. If only she behaved that well for dogsitter Kevin, I'm sure he would have a much more pleasant time with her. 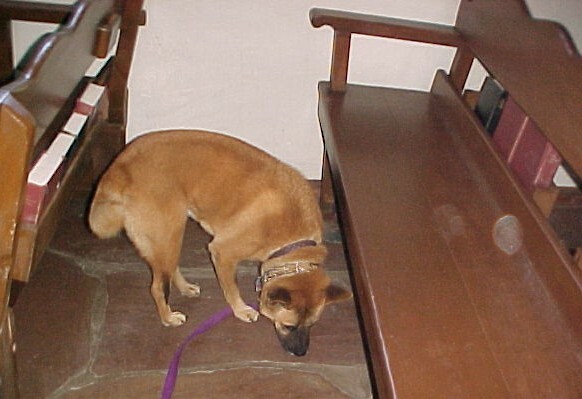 On Sunday, I'll bring you back some fresh pictures of dogs in church! Weekend Assignment #131: We've all got a little bit of a devil inside. Share a (small) moment in your past where you did something a little less than entirely ethical. I'm not thinking of moments that could, you know, have you tracked down by the police because the statute of limitations is about to expire: Those big trangressions against the law and morality you should probably not reveal here. We're talking a little bit bad here. Extra credit: Devil's food cake vs. Angel's food cake: Which do you prefer? Humph. I wasn't expecting a kind of Spanish Inquisition. But then again, nobody does. This is not my Favorite Topic Ever. I feel guilty even thinking about the subject, and frankly, I have enough guilt in my life. Even before I get to actual, clear-cut sins, I can feel guilty about lack of diet and exercise, lack of sleep, the friend I promised to call two weekends ago and haven't phoned yet, the dishes in the sink and the laundry on the floor. Then there's the backlog at work I can't seem to get caught up on, which is only partly my fault. The other major distraction toward the end of my decade-plus at my previous job was schoolwork. 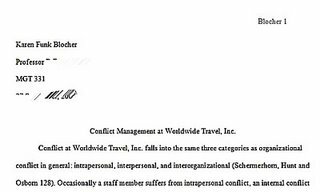 When I was at the University of Phoenix, I also sometimes finished writing papers at work on the day they were due. I've tried to make up the time spent on such things by staying late, but I usually didn't quite manage it. Really, though, if I worked eight hours nonstop, my brain would be even mushier than it usually is at work, and I wouldn't get that much more done. Other people chat at work, or go outside and smoke. I check my watchlist. But I really shouldn't. That's it. That's my big confession. How about you folks? Do you blog at the office? Do you work on school stuff? Watch videos? Do something else you shouldn't? On the angel food / devil's food question, I used to be quite fond of the light, sweet squishiness of angel food, but I haven't had it in years. I suspect it wouldn't appeal as much to me now. On the other hand, it's hard to go wrong with chocolate. Just don't let it get dry from overbaking or staleness or a bad recipe, and don't put some horrible sweet icing on it. Whipped cream-based will be fine. Earlier tonight, after some gentle prodding by Sarah (not Sara), I finally finished writing and posting my serial The Jace Letters. I crammed four emails instead of the usual one or two into the conclusion of this all-email, epistolary story of a godmother who has been kidnapped out of normal space/time, and the goddaughter who teaches herself physics in order to rescue her. Something else entirely - the catch is, YOU have to suggest the premise, and I have to like it enough to do it! What say you? Shall Katie Specks regale you with the story of her escape from normalcy? Would you like to know about Del and Crel and Rani as children? Are you curious how a reluctant ghost gets a novice wizard off the hook after they're framed for armed robbery? Does the idea of Mâvarin apocrypha appeal to you? Or are you dying to see what I'd do with that fun idea you've been kicking around? Let me know, okay? Kate, Jace, Rani, Josh and I thank you. The next Round Robin Photo Challenge, "ABCs of Autumn," has a posting date of Wednesday, October 4th. The idea, courtesy of TJ, is to post Autumn-related pictures based on your first and last initials. 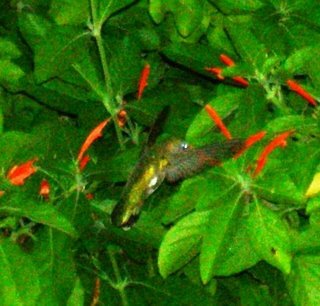 For example, this is a Kinetic Bird (KB), a hummingbird that is still in Tucson in September. (This photo is actually a rerun from the Round Robin blog's announcement entry. I hope you don't mind!) Click here for info on that particular challenge, and to RSVP if you'd like to participate. Everyone is welcome! Sooner or later, pretty much everything technological lets you down, particularly anything to do with computers. Both AOL and Blogger have been buggy this week. Blogger doesn't want to save entries, AOL Journals for a while refused to recognize a journaler and show the buttons for adding and editing entries, and now AOL won't show pictures I uploaded to Blogger on Monday night. Sigh. So I just uploaded all of those, plus the pictures for tonight, to http://images.mavarin.com. I used to do that all the time, because I don't much like the AOL photo uploading options, and I've had intermittent trouble uploading photos to Blogger in the past. Since switching to Firefox, I hadn't been having that problem, but now that Blogger's being unreliable again, uploading to mavarin.com seems like the sensible way to go. So anyway, here are some pictures and explanations. 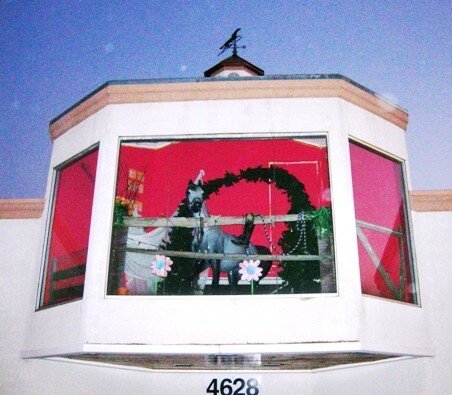 On Monday night, I wrote about my disastrous attempt to check whether the animal hospital on 22nd St was the building with a life-sized horse on the second floor. As you may recall, I got stuck in road construction, and no, it wasn't the right building anyway. The one I was thinking of is a tack shop on Speedway near Swan. Here it is. Can you see the horse? Tonight, shortly after sunset, I drove over to Speedway and Swan. I ended up driving around in circles for a bit, trying to find a back way on streets that don't actually go through to Speedway. Oh, well. When I got there, the store was closed and the upper room wasn't lit. All things considered, it's remarkable I managed to get these two photos to clean up even this well. The only thing I did to this one was stretch the corner a little to "straighten" the vertical bar, and crop a bit. The color and brightness values are exactly as the camera "saw" them. Version two. I lightened the shadows a bit, and the midtones a bit less, and boosted the saturation a moderate amount. Does it look better, more natural, or more interesting, or none of the above? I can't decide. Version Three is just Version Two with an Autocorrect applied in Microsoft Office Photo Manager. 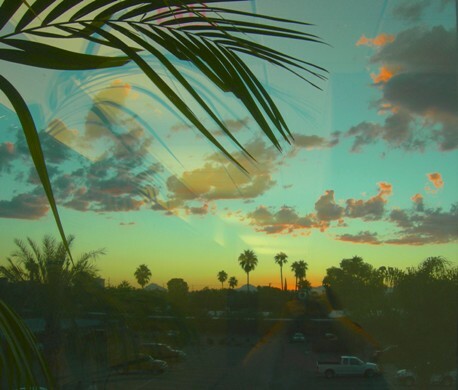 It produced colors seldom found in nature, at least in the sky. But isn't it pretty? I like those purple clouds. Same sunset, about seven minutes later. No, wait. This was tonight. The other was last night. All I did to this shot was crop and resize. There were a couple of minor but bizarre mishaps today that had nothing to do with technology. First off, John has a cold - or something. He seldom takes time off when he's sick, but he did it today. Poor Johnny! Second, Tuffy came to me this morning with one of her rear legs in the air. I knew she must really be uncomfortable, because she refused to eat a dog biscuit. I was on my way out the door to work, so I asked John to check her over. There was an ant between her toes! Poor Tuffy! She was limping even after John removed the ant, so we think the ant must have bit her. She's fine tonight, though. Third, I was nearly to the bottom of the steps from the second floor of Unnamed Largish Company today, heading out to lunch and to make a car payment, when I fell from the penultimate step and landed flat on my face - well, on my knees and hands, really - on the floor at the bottom. Why? How? I have no idea. I didn't trip over anything, as far as I know; and my knees didn't give way, as far as I know. I'm a bit scraped and sore, but it's no big deal. Except... how the heck did I manage to fall down stairs I take every day? Poor Karen! 4. What Do You Mean, It's a Start? Useful to some, provides a moderate amount of information, but many readers will need to find additional sources of information. The article clearly needs to be expanded. Substantial/major editing is needed, most material for a complete article needs to be added. This article still needs to be completed, so an article cleanup tag is inappropriate at this stage. But...but...but...! It has a picture and an infobox, a link or two, and multiple subheadings! Way to be harsh! I thought about asking the guy why this article didn't rate at least the next step up, but it was already 2 AM by them, so I just went to bed. But...but...but...it's not fair! I've been putting off writing this entry, mostly because I have little to say tonight in this particular forum. Or so I thought. As so often happens, once I started it, I quickly found myself in a rant after all. So When Did I Turn Into a Voluntary Essayist? I just spent a couple of hours revising the heck out of the Wikipedia article about A Wind in the Door, the second novel in Madeleine L'Engle's Time Quartet. The first time I looked at that page, as I recall, I didn't want to deal with it: the article pretty clearly needed a lot of work. 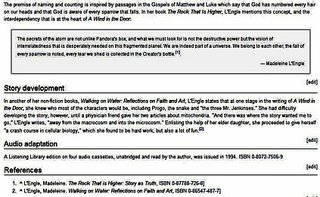 But over time I added bits and pieces, and tonight I gave the thing a major expansion and overhaul, complete with footnotes citing secondary sources. Hey, wait a minute! Isn't this the same kind of writing that almost killed me back in high school and at Syracuse University? It was my huge mental block about writing literary essays that kept me from taking my B.A. in English, way back in 1979. I left school with four or five incompletes, all of which represented essays not written. Now I'm writing them for fun, apparently. How the heck did that happen? Actually, there are a couple of reasons why this isn't as complete a reversal as it seems. Back in tenth grade, when Dan Cheney and I took a course in essay writing from Ms. Hiestand, we learned that there are all sorts of essays, and different kinds of essay structures. I actually liked that course, liked being exposed to a variety of ways to express myself in non-fiction. It was only after that, when teachers and professors consistently called for the rigidly-structured "five paragraph" literary essay format, that I found it harder and harder to give them what they wanted. 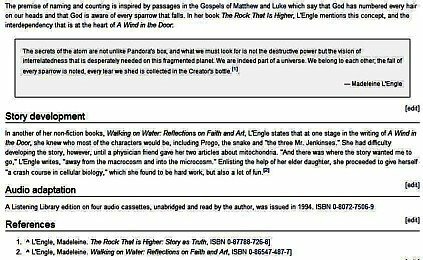 There was some trick to the thesis, example, relate the example to the thesis requirement that I just couldn't fathom, and the teachers couldn't seem to convey to me. But people change and learn things over the course of a quarter century, and even mental blocks can be chipped away over time. I'm not writing for Professor Howard now, and the literary essay isn't nearly the terrible, debilitating, impossible task it seemed to be when I was 22. For one thing, I got a lot of practice writing papers at the University of Phoenix a few years back. They weren't literary, but they were essentially in that same format. And I finally got it, and turned out all those papers with little difficulty after the first couple of courses. It's not, "Example B proves that Thesis A is true." It's, "As we consider Example B in light of Thesis A, we discover groovy Insight C."
Neat trick if you can do it. Really, though, almost none of my online writing is that structured, even on Wikipedia (although Wikipedia has some rules about "no original research" and about citing sources that rankle me a bit). Sure, the articles or blog entries should be organized in a reasonable way, and rewritten as often as needed to make sense, which is something I don't always do adequately here at the Outpost. But they tend to be the relatively freeform, train of thought, fun essays of Ms. Hiestand's class, not the dry blah blah blah of the traditional literary essay. When I have something to say on a given subject, I actually enjoy writing these. From the Star Trek-related articles and editorials in 2-5YM when I was seventeen, through my later fanzine and Starlog contributions about Doctor Who and Quantum Leap, to the zillion words of blog postings over the past couple of years, it turns out that I've been writing essays all along - and liking it. There are other bits of writing, though, that I've been putting off this week. My sheet of paper about Darsuma trying to diagnose her own problem has had no new words on it in several days. I need to type it into Chapter Six of Mages and continue it, with the stuff that's more or less sorted out in my head for her to consider and conclude. I also realized today that Fayubi needs to tell her something in Chapter Two that helps to tie the Chendoris bits in with the prologue. No, I don't expect you to understand what I'm talking about, unless your name starts with S or B. But trust me on this. It's not going to be that hard to write at this point, but once it gets to be midnight and I haven't worked on it, I tend to put it off for the next night. The same goes for The Jace Letters, except that I kind of think that's going to be harder. I should have posted the next installment over the weekend, and several nights in a row I promised to get it written. But I'm a little intimidated about it, because both characters know the Big Secret now, and I'm not sure they have much more to say to each other in emails. Well, I'll just have to try it and see. And I need to update the church schedule page and news blog. I don't wanna, and least not tonight (or last night, or the night before). Does that make me a bad person? All right: "the needs of the many" should be taken care of first. After posting this entry, I updated the two church pages anyway. The other stuff will just have to wait. Again. Your Monday Photo Shoot: Horses are nice. Show us a horse picture you've taken. It can be new, or one from your files. It just needs to have a horse in it. That doesn't sound so hard, does it? After all, at some point in my life, I must have taken at least one picture of a horse. Or I could take a new one. 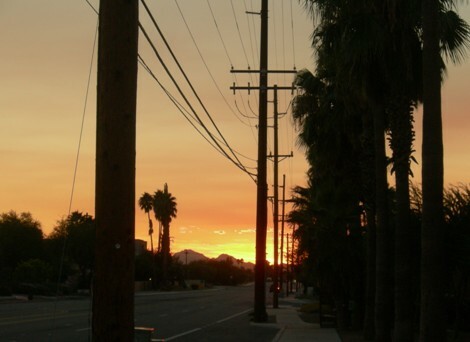 After all, this is Tucson, part of the fabled Old West. Well...yes. I've taken pictures of horses before. And yes, Tucson has its place in Western history. But no, it wasn't easy to come up with a horse photo. I thought it would be nice to actually take a new photo of a horse. But where could I do that, on a Monday evening in the city of Tucson? Contrary to the history and image of the place, it's been a long time since horses on the street were a common sight around here. But there's horse property on Tanque Verde Road, between the OK Corral Steakhouse and the Catalina Highway turnoff. So after work I turned right instead of left, and headed north and east. But it was sunset, and I guess the horses were in for the night. I didn't see a single one. 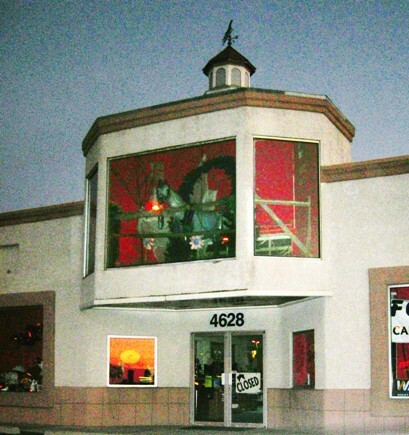 I kind of had the idea that there might at least be a life sized statue of a horse on top of the OK Corral restaurant. I looked as I drove by, on my way back from looking for the real thing. Nope. There was a life-sized steer on the roof. No horse. Well, then, what about Trail Dust Town? They have a Museum of the Horse Soldier, and lots of Western props and artifacts. But there was a car behind me as I pulled in, and the parking lot near the museum was full. I couldn't even get a good look at the graphic at the museum entrance, let alone take a picture. No horse statue outside, either. 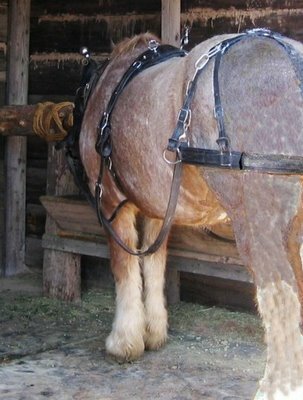 I drove around the complex, but although there were plenty of wagons, none of them had even fake horses to pull them. Drat! I went home. There are two buildings in town that remind me so strongly of each other that I don't always remember which one has a full-size statue of a horse in a lit second story window. That would be a neat trick, I think, and a neat picture - a horse on the second floor! One of the buildings is a saddle supply shop, the other an animal hospital. Both have huge windows and lit rooms on the second floor. One is a couple of lights from my home, on 22nd St. near Swan. The other is farther north, at Speedway and Swan. So when I went to get dinner for John and myself, I made a side trip to check whether the building on 22nd is the one with the horse. Bad mistake. The road was torn up at Craycroft, with a night construction crew working. One guy was in a hole up to his waist. The only lane open in either direction was the right turn lane. I was trapped for about twenty minutes, trying to drive a few blocks and then turn around. And - you guessed it - it's not the animal hospital on 22nd that has the horse in the window. It's the saddle supply on Speedway. And I'd already delayed dinner too much to go any further out of my way, just to take that picture. But when I got to Chuey's, which is half sports bar, half Baja-themed mesquite grill, I thought my luck had finally changed. 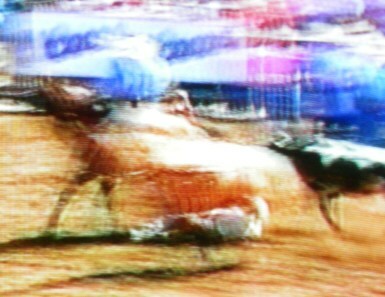 Some of the tv sets happened to be airing a rodeo! So while I waited for the food, I positioned myself by a likely tv set and started taking pictures. But darn it, those cowboys are fast! This was the best horse picture I got out of about eight shots I took. Mostly, I kept ending up with blurry action shots of the cowboy roping a steer on foot. I always knew I could resort to a shot like this if I had to. 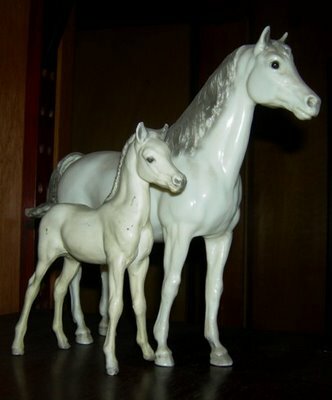 Here are a couple of old, plastic Breyer horses. The mare is the exact model and color of the Breyer horse I had as a kid. The foal turned up at a yard sale years ago, stained and with legs bent out of postition. It cleaned up fairly well, and although it's not perfect I like it. But Scalzi didn't say anything about pictures of toy horses. So I went through the photo files on my computer. I actually don't have a lot of horse pictures on it. Not at all. How about an "Iron Horse"? 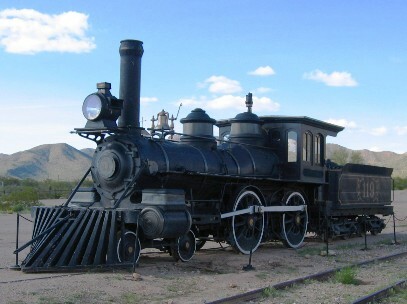 This is one of several shots I have of the locomotive at Old Tucson. 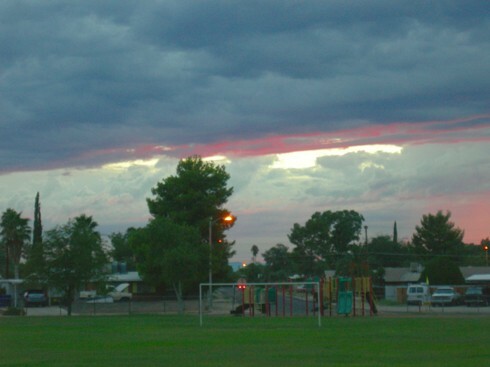 This is another Old Tucson shot. 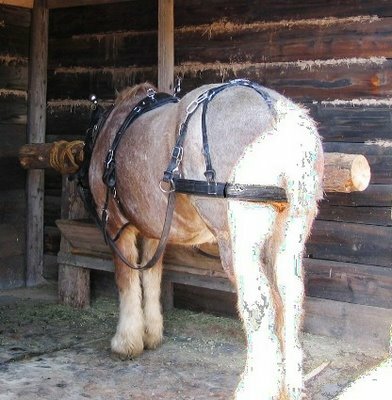 The rear end of this horse as photographed is terribly lightstruck, and you can't see the head much at all. As an experiment, I used the cloning tool on my cheap software to recolor the shaggy horse. How do you think I did? I'm not too happy with it, myself. My scanner has apparently died since I unplugged it recently, so that John could clean it and use it (he did neither). When I click on the scanner icon, it crashes the software. So if I want to show you a physical picture taken 20 years ago, I have to find a way to photograph the photograph without the image getting too flashed out or skewed. It took a while - three mini-photo sessions and about a dozen shots - but with the right arrangement, careful cropping and some photo editing, I finally came up with a picture that's not too, too terrible. I took this a few seconds before I got a much closer, better picture of the dog on the horse. I won second or third place once in a photography contest with that one, but I've used it in a Scalzi assignment at least once before. So we'll settle for the prequel. And that will have to do. Good night! P.S. You would think that would be the end of the struggle, but the Blogger server that hosts the Outpost was having problems last night and this morning. When I hit the "Publish Post" button, I repeatedly got a white screen that nevertheless said "Done" at the bottom (as in, "Done loading the page"). No confirming email, no entry when I refreshed the blog. Arrow back: the entry was still in the Create Post window, anyway. What a relief! I did a Save as Draft in case that helped, and the page showed a draft of the entry and also the actual entry. But the entry still wasn't there. Finally, at Carly's suggestion, I opened the edit window in a different browser, and posted from that. There was at least a minute of the looping notice that it was 0% published. Then, oh joy! 40%! Then 100%, and I heart the new email alert sound. Success! I'm thinking tonight about the concept and overall value of information. Yes, of course I'll explain. Somewhere around the early 1990s, my husband John briefly attended graduate school at the University of Arizona, working on his MLS. One of the courses as I recall included a convoluted definition of the word "information." 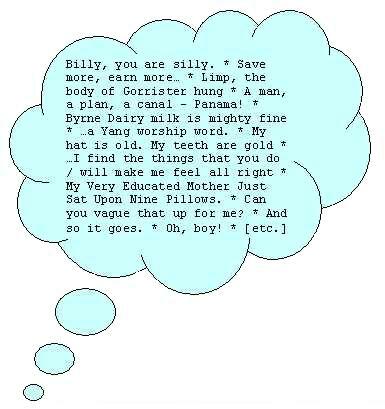 I don't remember what it was, only that it didn't make much sense to either of us, or bear much relationship to the word as it's used outside of academia. But ever since then I've been aware of what the concept means to me. I think of it as basically any kind of input the brain can process at a conscious level - sights, sounds, words, ideas, smells, anything. Some of it is "bad" information, in the sense of being inaccurate, biased, or encouraging evil behavior. Some of it is trivial, some of it is unwanted, some of it is important and desperately needed. None of it should be banned. Sure, bad information should be corrected if possible, countered by the corresponding good information. That's why when you send me some forwarded email that makes some kind of factual claim, I will almost always check the claim on www.snopes.com, and email you back the result. But access to information is too important to be filtered by some guardian at the gate that keeps people (adults, at least) from receiving and judging for themselves what is good information and what is not. I was thinking about this again tonight in connection with (you guessed it) Wikipedia. I happened to come across a "userbox" that advocated something called "inclusionism." In Wikipedia culture, inclusionism is the belief that the content of Wikipedia should not be constrained by outmoded notions about what is "encyclopedic," thus omitting internet phenomena, current events, items of primarily local interest, pop culture references, information of interest only to fans, etc. Inclusionists want to keep all that stuff, on the grounds that it's useful and interesting to someone, somewhere. Inclusionists are at odds with exclusionists, naturally enough. Exclusionists will nominate for deletion any Wikipedia article they deem to be "fancruft," "listcruft," "non-notable," or unencyclopedic. Is there no article in a major magazine about Disney Channel's policy of ending nearly every show after about 65 episodes? Then delete the article about the policy! Does Wikipedia have an article about an Iowa high school? Kill it! It can't possibly be important, especially if the deletionist doesn't live in Iowa. An all-time list of shows aired on CBS? Who needs it? You can guess what side I'm on in this debate. If the information is accurate and not ridiculously obscure and self-promoting (say, an article about a game you and your best friend made up in school last week), and someone took the trouble to write it, then it should probably exist. The fact that I don't much care about Boba Fett, the tv series Life With Derek, or a political party leader in New Zealand has no impact on the value of having well-written, factual articles available about all of the above. Who am I to say that nobody will care about Irlo Bronson Memorial Highway in Kissimmee, and that an article about that road is a waste of bandwidth? Heck, my own brain is a repository of far more obscure information than that! I've mentioned before that over the years I've developed a philosophy about what I personally am here to do in my time on this Earth. It all boils down to this: I'm here to collect, synthesize and disseminate information. Most of that information isn't vital to the survival of the species: I'm not curing cancer or finding a way to end all war forever. But that's okay. 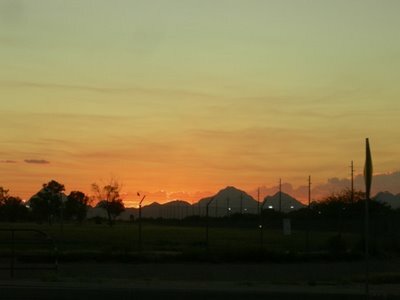 If I can share information about Madeleine L'Engle, Quantum Leap, Tucson, St. Michael's, sunset photography, my thoughts about Us and Them, even what Darsuma says to the spirit of Fayubi in Chapter Four of Mages, that's at least mildly life-enhancing, for anyone who cares to receive and process it. If I can determine how much a particular item costs at branch XXXX of Unnamed Largish Company, I'm helping the company and earning my salary. This is what my brain does. This is what I care about, aside from particular people and general principles of kindness and reason and so on. Yeah. I'm all about the information. Give me information. Let me give you some. Spread it around. After all, isn't that what the Internet is for? I finally managed to give blood this afternoon, after three or four false starts in a row (too anemic at least twice and then I had that cold). After that I bought myself some underwear, had a steak lunch that wasn't worth the money, did a little writing, and started reading the next L'Engle book, A Swiftly Tilting Planet. The rest of the afternoon and evening I mostly spent on Wikipedia. At first I mostly checked recent edits for vandalism and refined the articles about several L'Engle characters. But at some point, somehow, I stumbled into an article about "Why did the chicken cross the road?" and ended up wandering through a large number of rather interesting articles about humor, metahumor, jokes, metajokes, anti-jokes, fizzbin, and fictional colleges. I also glanced at the articles on optimism and pessimism. Both were illustrated with the same picture of a glass of water, each article with a different caption. That was funny in itself. Orange you glad I didn't say "banana" again? A: How many time-travelers does it take to change a light bulb? Anti-humor is a type of indirect humor that involves the joke-teller delivering something which is deliberately not funny, or lacking in intrinsic meaning. The audience is expecting something humorous, and when this does not happen, the irony itself is of comedic value. Anti-humor is also the basis of various types of pranks and hoaxes. The point of tonight's entry, with all the references to non-jokes and metahumor, is this. The subject line above is a quote, something Ringo said in A Hard Day's Night. I don't have a lot to say tonight, but what little I did want to mention fits under that general heading. I've mostly been reading all night, finishing up Many Waters, the third book (from the characters' point of view) in Madeleine L'Engle's Time Quartet. I don't remember whether I started rereading it late Wednesday night or sometime Thursday, but I do know that it kept me up Thursday night until nearly 3 AM, and even longer tonight. Many Waters wasn't published until 1986, the same year we moved to Tucson. The other three books are older, and are therefore more familiar to me from many readings than this one is. But I'm supposed to be a bit of an authority on the subject of Madeleine L'Engle's work, and it's been close to a decade since I last read through a significant chunk of her writing. Mostly I look stuff up, hunting through certain books to settle one question or another. For example: is the first name of character Dennys Murry really Dionysus? Some people seem to think so, but I haven't found a reference yet, either way. His twin, Sandy, is revealed to be an Alexander, one of three members of the extended Murry-O'Keefe family with that first name. But Dennys didn't say his name was short for anything else. That doesn't prove the negative, though, so I'll have to reread the later books he's in also. When I'm done making my way through the series, I'll be better prepared for working on the related Wikipedia articles, and for answering the questions I get because of my L'Engle web site. Meanwhile, I was supposed to get some fiction writing of my own done this week, and I'm happy to say that I did get a little bit of that in. I printed out the page with the two paragraph intro to the mostly missing scene, and on Thursday and Friday at lunch I wrote part of the next bit. In trying to solve the problem of how Darsuma tries to find out what's wrong, I ended up having Darsuma try to solve the problem of how to solve the problem. Basically she's taking notes for me. This is not at all what I had in mind originally - I wanted her to do something flashy and impressive - but it makes perfect sense. And if the scene doesn't work out, I can always cut it entirely. Last weekend I finally wrote the email in The Jace Letters that reveals what the heck has been going on all this time. In a way it seems as though the serial could and should end right there, but I don't think I'm going to do that. The longer it continues from that point, the hard it will be to do well, and the more the tension in the story is likely to dissipate. But I kind of like the challenge of finding a graceful way to end the story, without breaking a structure that isn't really suited for what happens next. Now here's the slender point on which I mean to hang these words. As this blog has "gleaned my teeming brain," I find more and more that I can't continue indefinitely without fresh input in the form of words, preferably words on paper. There may be no universal rules to writing beyond the fact that one must actually write to be a writer; but one bit of advice that crops up frequently is that one must be a reader as well. In recent years I've devoured each new Harry Potter or Pern book as it came out, but beyond that I haven't read nearly enough fiction so far this century. I need to do something about that, to replenish my formerly teeming brain. 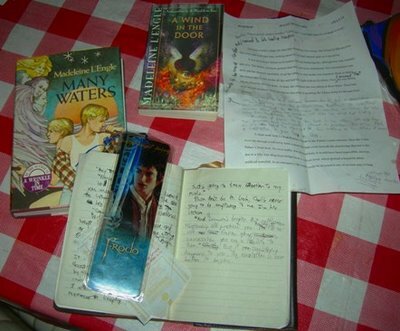 If I read my L'Engle books and analyze them for Wikipedia, I should learn more along the way about what she does well in her books, and how she does it, and what works less well, and what applies to my own writing, and what doesn't. I've noticed, for example, that A Wrinkle in Time ends each chapter with a crisis, just as the Nancy Drew and Bobbsey Twins books used to do. I have a tendency to use this same, rather old fashioned technique, but I hope it's a little less obvious than in Wrinkle. And of course, the other books I must learn from are my own. I learn writing best by writing, but lately most of my writing has been non-fiction. That may help with things like sentence structure, but it doesn't do a thing for my plotting and description skills. To improve in those areas, I have to just write the stuff. And to write the stuff, I need to see it down well by other writers. Funny how that works. I just happen to have a few thousand books here, maybe a third of them fiction. I'll never get to them all. But I can peek at a few - and then write something almost entirely unlike them. Tell us if you like or don't like baseball (which is Athena's favorite sport), and (as extra credit) if you played it as a kid (or would play it, if you were a kid now). Write it up in your blog or journal and then come back here and leave a link. Athena thanks you for your cooperation. Yes, I like baseball a lot. It's my favorite sport, too. Really, it's the only sport I like, except maybe ice skating and bowling and archery, and does horseback riding count? That, too. But do you play baseball, or softball, or both? When I was a kid, girls only played softball. They weren't even allowed in Little League. It didn't matter to me, though. I wasn't any good at softball in school. I just stood around in the outfield until it was time to come back to the fence behind home plate, and wait for my turn to swing at the ball and miss. At least, that's how I remember it. It was a long time ago. Forty years! Now I live in Tucson, where the University of Arizona softball team is. They win a lot of national championships. I really should go watch them play. And there's a women's pro team here, too, the Arizona Heat. But look! Now that I'm an old married lady, I have my own fielder's glove and batting gloves, a softball and both a wooden bat and a metal one. I've been to batting cages with my husband John, and I've practiced throwing the ball high in the air and catching it, over at the ballpark. I haven't done it in a long time, though. Look. The fielder's glove is all dusty! I'm not good at it anyway, but I know I'd get better if I got a lot of practice. But it's hot here most of the time, and I'm always inside and on the computer, and I don't have anyone to teach me to play. I should have paid more attention when I was your age. I really wish now that I'd given gym a chance, instead of just hating it because I wasn't good at most of it. Mostly, though, I like to watch baseball more than I like to play it. 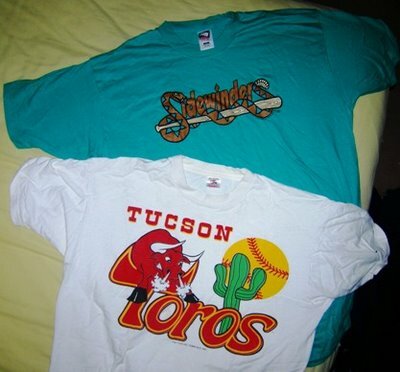 Back in 1993, when I started going to baseball games, the local team was called the Tucson Toros. They were great! We learned the names of all the players, and got their autographs on a baseball and a plastic helmet and on trading cards. And they won! They were the Pacific Coast League champions that year. So we kept going to watch them play in 1994 and 1995 and 1996, but they weren't champions again. And then everything changed. They went to a different ballpark that was new and farther away, and it was hard to get autographs there. And the team's name was changed, and none of the same players were there any more, and other stuff happened that we didn't like. So we stopped going to the games. We loved the Tucson Toros, with Tuffy the Toro for a mascot, this big friendly bull. But the Tucson Sidewinders are named after a snake, and their mascot is a snake with arms. How dumb is that? But of course a mascot has to have arms, just like the person inside the suit. I kind of wish we'd gone to some of the games this year, though. 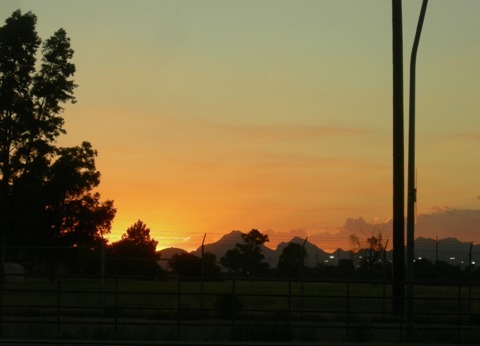 The Tucson Sidewinders had the best season in the history of Tucson baseball. They won 91 games during the season, and only lost 53, the best in all of baseball. Then they won every single playoff game, first against the Round Rock Express from Texas and then against the Toledo Mud Hens. The Sidewinders are the champions of all of AAA baseball for 2006, and AAA is just one step below the major leagues. Pretty cool, huh? 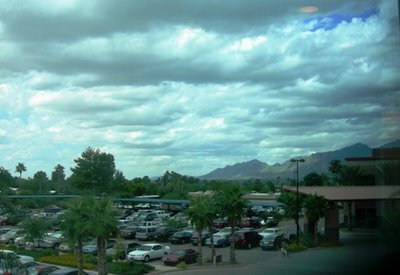 Several days ago, I mentioned in this blog that the monsoon, Tucson's summer rainy season, appeared to be over. The clouds had been completely gone from the sky for several days, and I anticipated no more significant rain until January or so. Part of the point I was making was that there would be no more cloud and rain pictures for a while, and that the sunset pictures were likely to be "dull, dull dull" without clouds to reflect and refract the colors. Then there was a prediction of more rain on the way, and indeed the cloud cover looked very promising when I went to lunch today. The cloud photo here is corrected for brightness and contrast and color balance, which it needed because it was taken through a window that gives things a darkish blue tinge. But this afternoon a wind came in, and the clouds blew out of the city, banished as usual to hanging out over the mountain ranges that ring this valley. Still, that left a few clouds on the horizon to liven up the sunset. 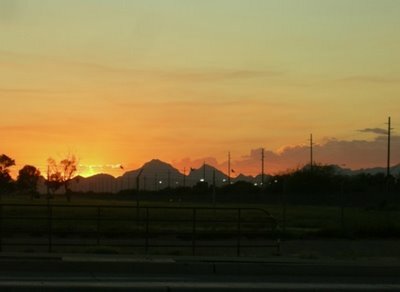 These sunset shots are all from my favorite nearby vantage point for such things, the parking lot near Safeway at Golf Links and Wilmot. I park at the western edge of the lot, actually much closer to a new Subway than to the grocery store. 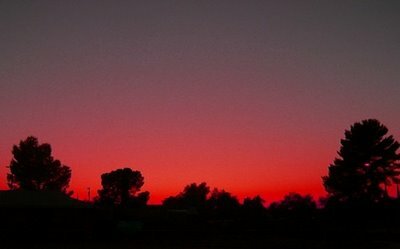 Last time I brought up the subject of sunsets here, I showed you how an almost completely colorless sunset photo can be edited to look brightly hued and dramatic. Tonight, because the photos are good enough to support it, I've done the opposite. Unlike the cloud photo at the top of this entry, these three sunset photos are not autocorrected or saturated or lightened. All I did was rotate as needed, crop and resize. No song and dance tonight, no big digressions or essays or photo manipulations. I'm tired and I must sleep for a change. Tonight I took an hour off from blogging to go to Barnes and Noble and work on a mostly-unwritten Darsuma scene for Mages, but I didn't get to it. I finished reading A Wind in the Door instead, because it was easier. Well, I'll get to it, probably Friday. 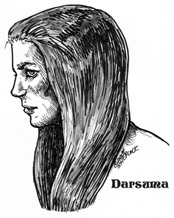 Tomorrow evening I've got the announcement of the next Round Robin topic and a new Weekend Assignment to tackle, so I may not have time for Darsuma and her spell. In the meantime, good night! And is taken off the market in the afternoon. It's been good to me if it's been good for you. This week's Round Robin Photo Challenge, "Dream Homes," comes to us from Gem, of the journal Journally Yours. I'm sure she didn't have in mind what I'm about to "unlease" on you. Come on along, and park in the driveway, or in the street, or in the back recesses of your mind. I'm holding Open House on the house of my dreams - and my nightmares. I'm going to do my best to show you at least a photographic impression of the house I dream about - literally - pretty much every time I remember any dreams at all. The house I live in when I'm asleep is based on the house I live in in Manlius from 1961 to 1976. But there are elements of other houses I've lived in, and of houses I've never lived in with eyes open. For one thing, it's bigger than the real thing. For another, it has strange rooms and stranger inhabitants. But it's home, and I love it. The shot above is a composite of a 1971 photo of the house in Manlius with today's photo of the house I live in now. 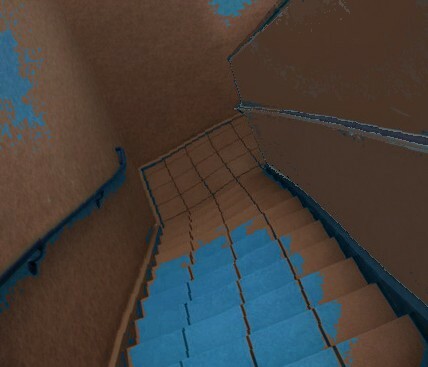 Careful of the stairs; a few are missing. I haven't had the time to make repairs. Last one I'm not really sure is there. There were lots of stairs in the house in Manlius. Our current house has none. And I come back to hear it now and again. But in this room, a part of you will remain. When I was four years old, we bought the house in Manlius before the basement was finished. It was still basically a dark, room-shaped hole in the ground, with no way down except by falling in. I immediately thought of Mike Mulligan and the steam shovel (characters from a kid's book Captain Kangaroo used to read on tv), but I had nightmares about it for many years afterward. 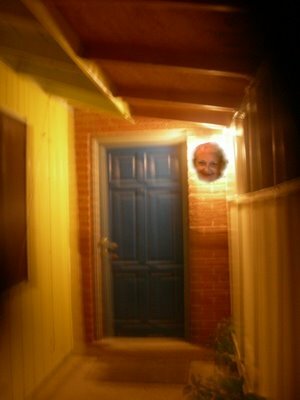 I can't swear to you that that nightmare basement isn't part of the house I live in when I'm asleep. But I know I also dream about the basement as it was later, with a game room where we hung out and listened to the Beatles and the Monkees and comedy records about psychology. 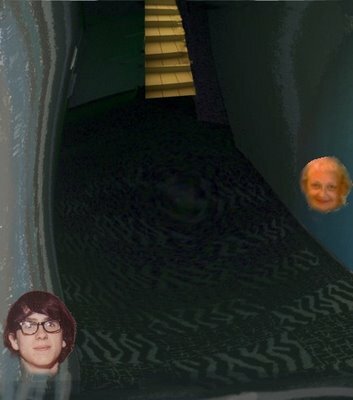 Except that the real basement never led to a secret room as the dream basement does. Second floor, the lady sleeps in waiting. Pass the lantern, tiptoe in its glance. In this room, the hardest one to pass. 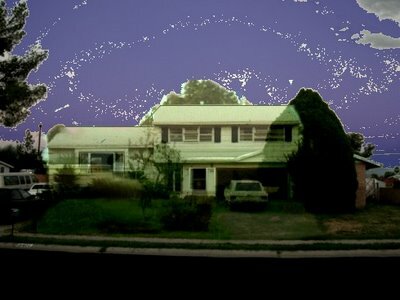 Another unique feature: my Mom is almost always in the dream house. I'm generally either unsure whether she's dead, or sure that she is but afraid to mention it to her. When Dan turns up, as he occasionally does, we don't discuss the fact that he's been dead for thirty years, but there's never any question of it. Come to think of it, Tracy's stopped by, too, and I've done my best to convince myself that I was mistaken about her dying several years ago. 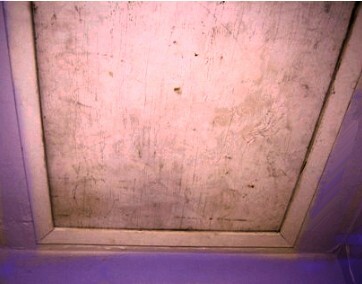 How much will you pay to live in the attic? I've dreamed that the house has at least one secret bedroom. Perhaps it's on the other side of this panel. Now go see the rest of the Round Robin entries, most of which are sure to be less disturbing than this one. And yes, you're welcome to join in yourself! Click here for details! Nancy Luvs Pix - Posted! Where Life Takes You... - Posted! Your Monday Photo Shoot: Post a picture that focuses on the contrast between two opposing colors. What colors are opposites? Green and red are opposites, as are blue and yellow, and orange and purple. So a picture that has something purple in front of something orange would work, or a picture that features blue and yellow in alternating stripes. The subject of the pictures could be anything you like -- but there have to be opposing colors in there. Seems to me that "opposite" colors should be complimentary - two colors that between them contain each of the three primary colors---red, yellow, and blue--exactly once. That means red and (yellow+blue=green), blue and (red+yellow=orange), and yellow and (red+blue=purple). Then there are the RGB (red/green/blue) and CMYK (cyan, magenta, yellow, black) color systems, but those confuse me, no matter how many times John explains them. So we'll stick with what I learned in school at age 8 or so. The color combination I chose is blue and orange. 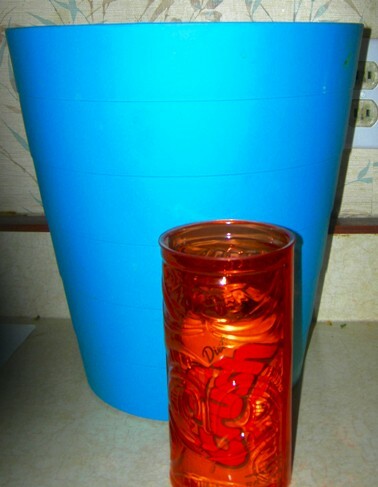 Actually, I mostly ended up with turquoise and orange, because we have a lot of turquoise colored items around here. It's a midcentury modern kind of color. Close enough, right? 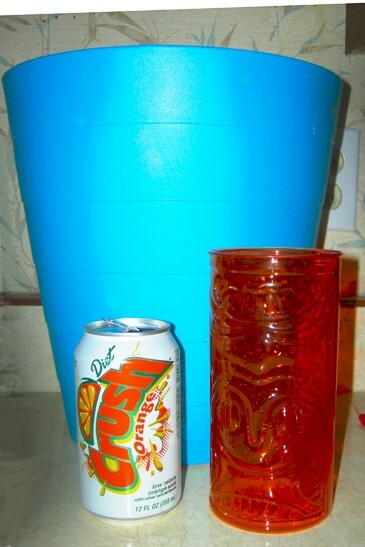 You probably can't tell, but the orange plastic tumbler here is a tiki cup. I got it for John at K-Mart a year or two ago. The Diet Orange Crush is something I drink a lot of in the evenings, especially in summer. 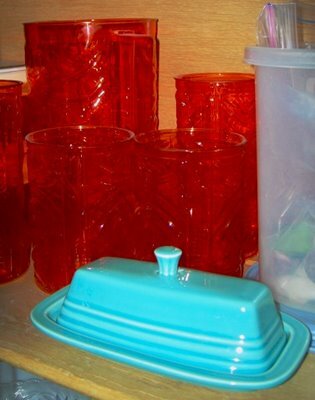 Here are the tiki tumblers in their native habitat, behind the Fiestaware butter dish in the sideboard. 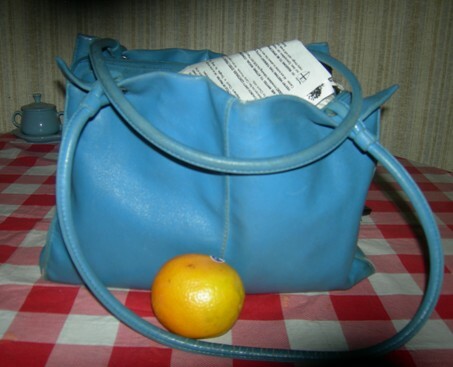 This is a slightly bluer blue, and an oranger orange. Being an organic Valencia, though, this orange is less orange than many oranges. And let's finish off with a different color combination: red and green. 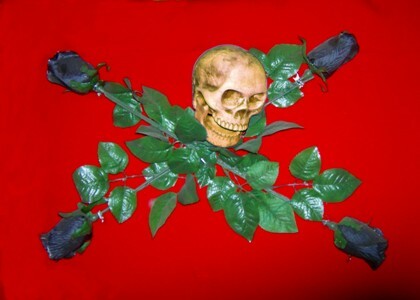 Aye, I be hoisting the colors of bonny Black Rose Katie Specks, in case the wench turns up for Talk Like a Pirate Day! Mind ye, I've no guarantee she'll sail into landlocked Tucson any time soon. Still, an ye have a question for her, and mayhap I see her, 'tis certain I'll be passing it on! An 18th Century pirate looks at the modern world. Is this the single dullest sunset photo you've ever seen? It's certainly the dullest one I've posted. 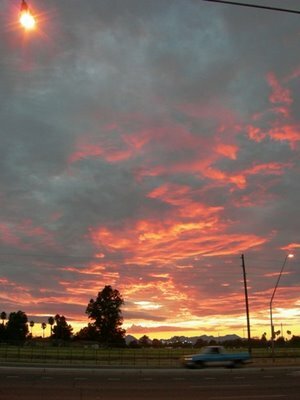 This was sunset in Tucson tonight. 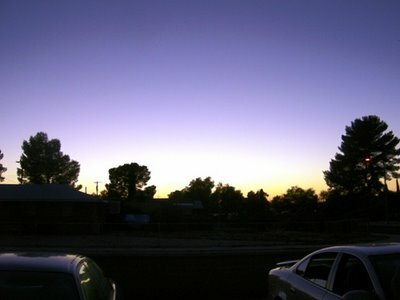 Granted, sunset was almost over by this point: I came outside too late to catch much color digitally. The main cause, though, is the fact that the monsoon is apparently over. See? No clouds. There haven't been any clouds in a few days now. There probably won't be any significant clouds again until January. Without clouds, sunsets in my neighborhood are sure to be dull, dull dull. The only to make Tucson sunsets interesting this time of year is to be somewhere at sunset that offers an interesting horizon, such as mountains, or saguaros, or the airplane graveyard. I can show you a leftover image from a past sunset. Such as this one. I think this particular shot is pretty much as photographed, except for an autocorrect, which changed it very little. Or this one. I did boost the saturation on this one, trying to recreate what my eyes saw. If I didn't tell you this, would the photo be a "lie"? What if I stuck with tonight's photos, and played with those? This one is simply an autocorrect. It didn't give us any color but blue, though. But how about this one? I cropped it, boosted the heck out of the saturation, and changed the hue. Too much? Then how about this one? Same shot, not cropped, autocorrected, saturated, contrast up, hue changed but not as much. If I didn't tell you all that, would you believe that's what I saw in the Tucson sky tonight? It wasn't. Reality was blue, with just a hint of color down at the bottom of the sky. Dull, dull, dull. 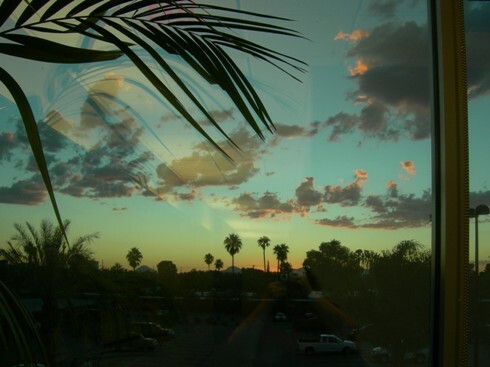 So, is it wrong to take a colorless sky and make it pretty? 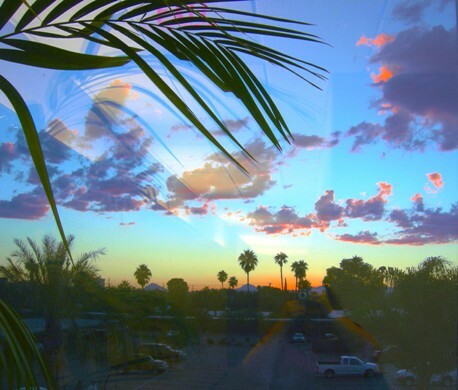 Is it wrong to take a pretty sky and make it spectacular? Beats me. What the heck have I done all day? It's over now, and I keep trying to account for all the hours. This morning's church ran into the afternoon, so that's part of it. The Mass itself wasn't much longer, but our church administrator, Alicia, retired, and coffee hour was her party. My friends Kevin and Mary and I stayed until the very very end, as Father Smith was locking up. Then Kevin and I chatted with Mary in the church and in the parking lot, and after that Kevin and I went to Barnes & Noble. Dang! I meant to do something special for him to commemorate his turning 40, but I forgot. I'll have to make it up to him. Anyway, Alicia was given flowers, and I photographed her and her replacement, and some prayer shawls that were blessed during church, and lots of other stuff. Most of those pictures are to be posted on the St. Michael's blog this week, but maybe I'll show you one or two of them another time. So that took me up to 2 PM. I came home from B&N with a L'Engle paperback of A Wind in the Door so I don't mess up my hardback any further, rereading it. I'm almost halfway through the book now. Other than that, I watched some tv, and went shopping with John, and read a few blogs but not many. So now I either have to cut the scene or write it. There may be some sitting in restaurants in my future, trying to get that done. I opened up the fiction blog tonight to write the next entry of The Jace Letters, but I'm just not up to it tonight. I haven't slept well this weekend, and I'm not quite over this cold yet. It's just going to have to wait for Monday night. So, Are You Sick of Sunsets Yet?